We Coach directly with the people who influence and make key decisions within a business. We believe that true change starts at the top, leading by example and embracing their business Values and Mission, and then reflecting them in their actions. Positive change is then consequently implemented sustainably and efficiently across the business and its resources. Is there lack of Co-operation and Teamwork? Is Staff turnover high, loyalty and performance low? Is time being managed effectively? Are you thinking strategically enough and constructing the plans needed to achieve goals in your personal and business life? Is your business reflecting your Mission and Values Statements? Do you have an Organizational Chart and clear Job Descriptions? Do Staff know everyone’s roles and the Management reporting? Our methods have been established from our extensive coaching experience across a diverse range of business, industries and countless sessions with individual Clients. Our system ensures results are consistent and repeatable when our clients put the coaching into practice. We can support you with your Performance Review Documentation and the Interview Process using a Strengths Based- Positive Psychology- Coaching approach. This will result in empowered, efficient and motivated Staff, and improved systems including updated job descriptions and realistic/workable KPI’s. Here is a Testimonial from one of our Clients. “I would like to sincerely thank Mary for her help in doing out Staff Reviews. It has made a big improvement from previous years in helping me improve as a Manager, and in getting better results and outcomes from our Staff. I would recommend to anyone Mary’s services.” Martin Wearmouth, General Manager, Bladon WA (Balcatta). 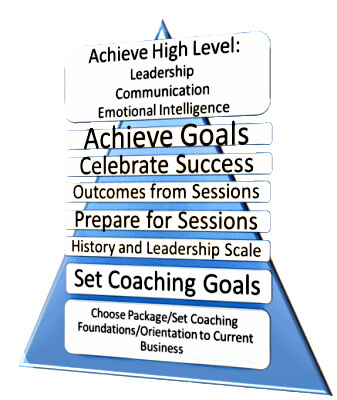 Coaching as a sounding board and awareness, at a high Strategic level, as it can be ‘lonely at the top’. Support to remove mental blocks/obstacles. Shadow coaching is real time feedback (versus reflective) model. The Coach shadows the Client throughout their day. This provides an objective perspective and results in eliminating unwanted habits or challenges. It also creates a heightened level of self awareness and creates the opportunity for accelerated learning. Shadow coaching is most effective in and full day intervals, promoting the opportunity for a client to practice new behaviours, while focusing on consistency to anchor the change. Team Coaching is a unique approach to working with teams as a whole or system, rather than as a group of individuals. Our intent is to reveal the team to itself, how the members interact with one another and how they can do so more effectively and efficiently. Team Coaching works because there is consistency and commitment to continuous personal and professional growth based on mutual respect and trust. The outcomes are measurable as staff begins to achieve goals, set new ones and embrace change at deep level. Our client’s productivity rises, staff self-confidence improves and both internal and external communications are enhanced.